Buddhists across the Eastern Seaboard lit the way for retiring monks with candle parades to mark the start of Buddhist Lent. 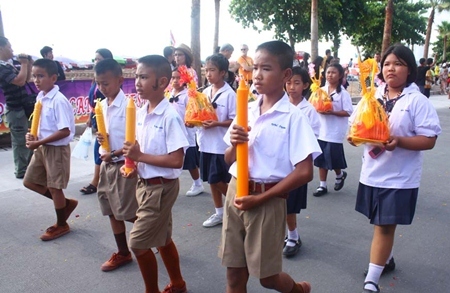 In Pattaya, students from Pattaya’s 11 public schools competed to decorate the most beautiful and creative lent candles while believers paid respects to a famed Bangkok Buddhist relic during the July 18 parade down Beach Road. 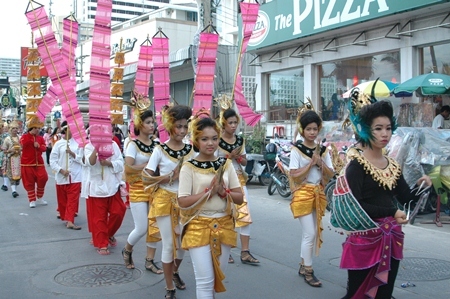 The procession carried the candles on lavish floats down Beach Road where they were parked near Walking Street for display. 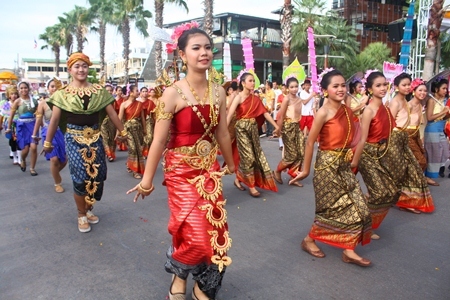 More than 100 people participated in the parade, as crowds swelled along sidewalks from Central Road to Walking Street to see the floats and costumed marchers. 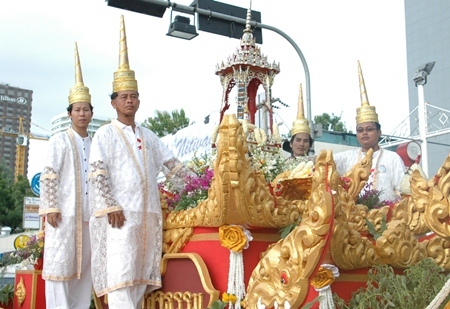 Mayor Itthiphol Kunplome begins the sacred Buddha relic procession. Pattaya School No. 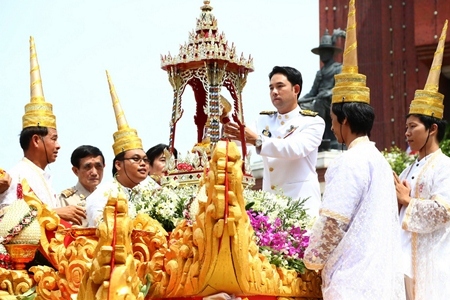 7 won the top prize for most beautiful candle and 20,000 baht. School No. 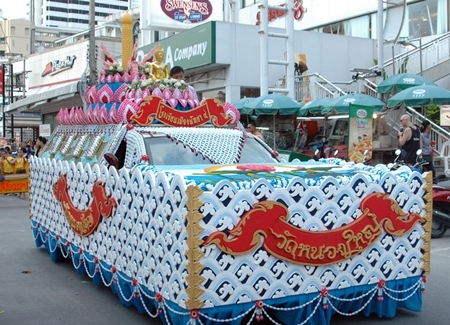 2 took the 15,000 baht second prize and Pattaya School No. 8 took third and 10,000 baht. 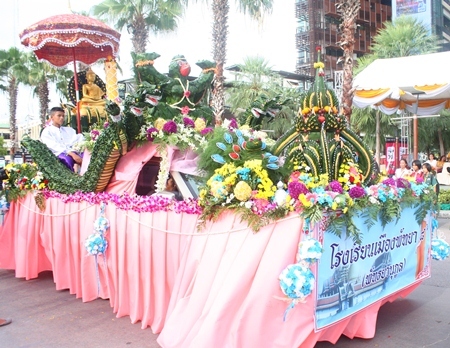 In the creative category, Pattaya School No. 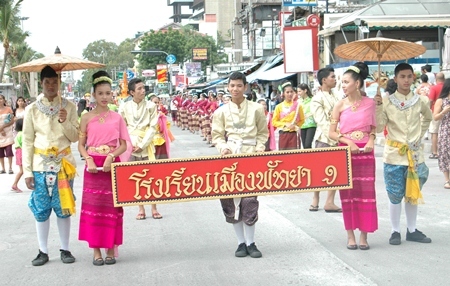 4 won the 20,000 baht first prize, with School No. 6 placing second for 15,000 baht and School No. 3 winning third and 10,000 baht. 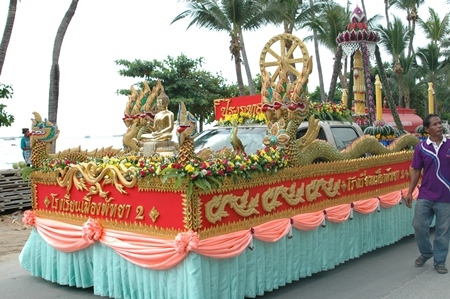 The highlight of the parade for many was the procession of the Buddha relics from Bowonniwet Vihara Temple in Bangkok. 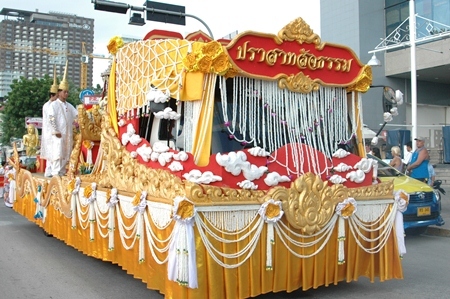 The highlight of the parade for many, however, was the procession of the Buddha relics from Bowonniwet Vihara Temple in Bangkok. 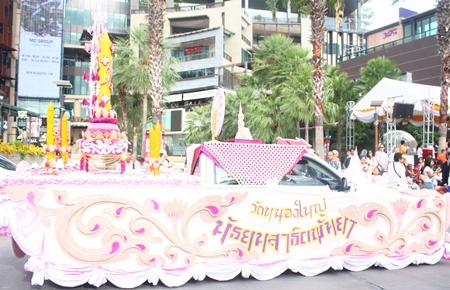 Lavishly decorated, the idol was loaned to parade organizers for the event. 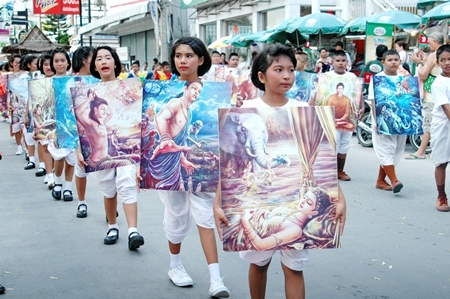 It was placed on display in temples in Pattaya and on Koh Larn during lent week. In Najomtien, Nong Nooch Tropical Garden put its own spin on the traditional candle parade with Issan arts, swans and, of course, elephants. 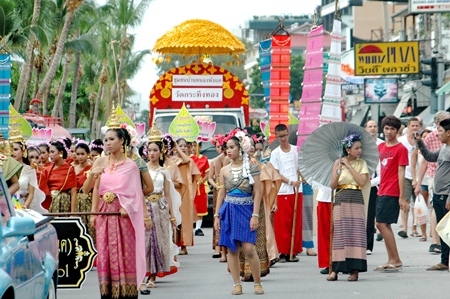 The parade featured a single candle, more than two meters tall, carved in Thai style and carried on the back of two swans. Thai women dressed in traditional costume sat next to the candle. The team from Pattaya School No. 7 has something to dance about, as their candle won top prize in the most beautiful category. 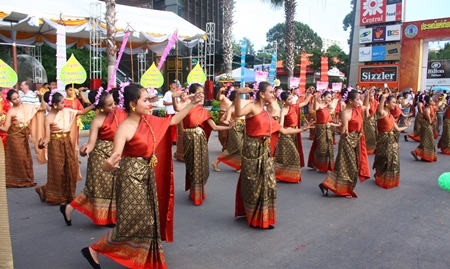 The parade was followed by a fleet of cultural and local arts, traditional dances, Tung Issan sets, a woman carrying a candle, and others performing Issan traditional dances. The park’s 39 elephants brought up the rear. 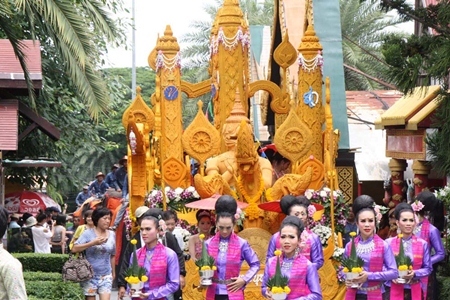 Nong Nooch Director Kampol Tansajja said more than 2,000 people attended the parade, which followed the park’s offering of nine candles to nine area temples. School children march with their Lent candles in this year’s parade. Lent candles are longer and larger than normal candles placed in temples from the start of Buddhist Lent till the end. 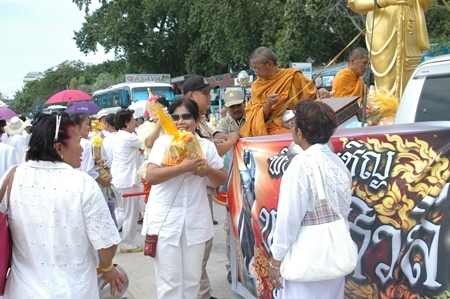 The Buddhist Lent candle ceremony originated more than 2,600 years ago and is a long-established tradition in Thailand. The Lent candle parade, too, is entrenched in society. It calls for the cooperation of community residents in making and donating the candles. 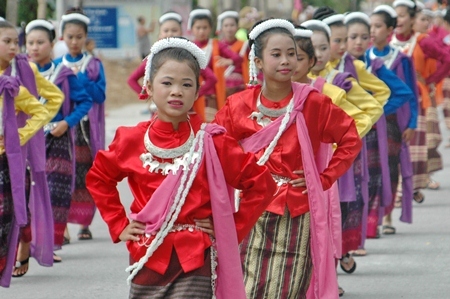 Floats are decorated with items found or made locally and dances are based on local traditions. In the creative category, Pattaya School No. 4 won first prize. 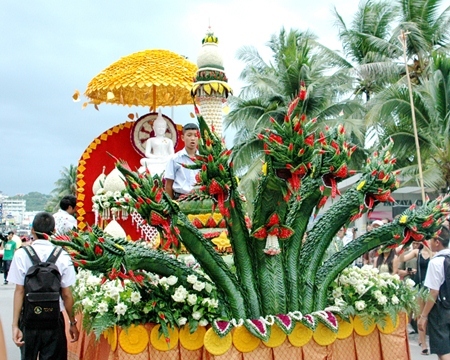 The parade at Nong Nooch Tropical Garden features a single candle, more than two meters tall, carved in Thai style and carried on the back of two swans. 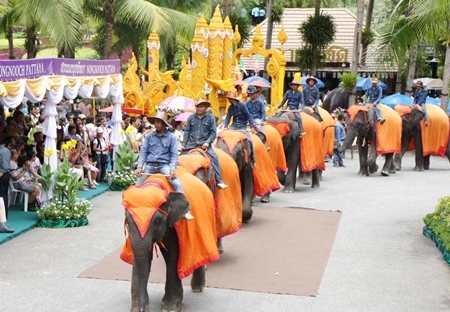 Nong Nooch Tropical Garden’s 39 elephants bring up the rear of their parade. Pattaya School No. 7’s candle car won the most beautiful category.